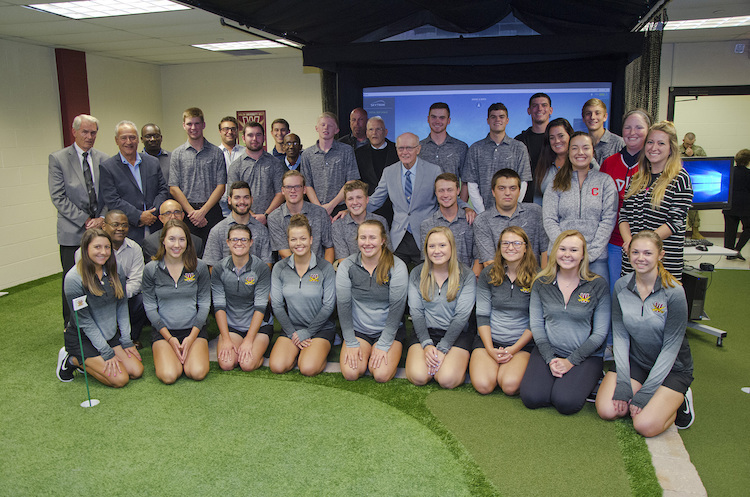 Members of the Walsh University community gathered together to formally dedicate the University’s new indoor golf facility in honor of longtime Walsh Golf Coach and Administrator Br. James Lacasse, FIC. The special event included a blessing of the facility by Father Thomas Cebula, remarks from Walsh President Richard Jusseaume and shared memories of alumni and friends who knew Br. James well. Special guests included the men’s and women’s golf teams and the brother of Br. James, Joe Lacasse and his wife Linda, who flew in from California for the dedication. The new Brother James Lacasse Indoor Golf Facility is located in the Gaetano M. Cecchini Family Health and Wellness Complex. This state-of-art athletic space will provide Walsh golfers the ability to practice year-round. 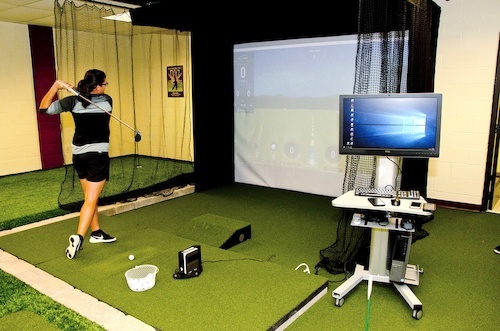 Women’s Golf Head Coach Christina Paone spearheaded the project and helped to lead the development, fundraising and oversaw the final installation of the equipment. Br. James Lacasse joined Walsh in 1964. On campus, he was known affectionately as “BJ” and faithfully served the Walsh community and students in many roles for 31 years including as dean of students, registrar, director of financial aid, teacher, mentor and friend. He was also known as coach and, for 29 seasons, Br. James served as Walsh’s golf coach, leaving a legacy of 1,723 victories, 12 Mid-Ohio Conference crowns and five NAIA national appearances. BJ was named conference Coach of the Year 11 times and District Coach of the Year three times. In 1992, he was inducted into the Walsh Athletic Wall of Fame, and in 1995 the University presented him with the Distinguished Service Medal. Br. James’ formation as a member of the Brothers of Christian Instruction began in 1939, and he entered the novitiate in 1942. He was a 1952 graduate of LaMennais College and earned graduate degrees in education from Boston College in 1958 and mathematics from the University of Detroit in 1963. He began his career as an elementary school teacher in Plattsburgh, New York, and in Sanford, Maine. Later, he taught high school at Mt. Assumption High School in Plattsburgh, Msgr. Prevost High School in Fall River, Massachusetts, and Cathedral High School in Detroit, Michigan. Born in Waterville, Maine, on December 17, 1926, he was one of 10 children. Br. James Lacasse passed away in Maine on April 16, 2018, at the age of 91.